Montana is ranch country. And that means it’s also steak country. There’s no argument that you’ll find a good cut of beef in Montana, the trouble comes in narrowing down the selection. But that’s what we do, and here are our favorite steakhouses in the state! A meat mainstay for more than a quarter century, Lolo Creek Steakhouse is one of the best-reviewed restaurants in the state—and has been featured on the Food Network. With seven steaks, seafood, and a pork chop to choose from, you’re certain find something that satisfies. Hungry? Try the Montana Steak: A 24-ounce slab of sirloin. 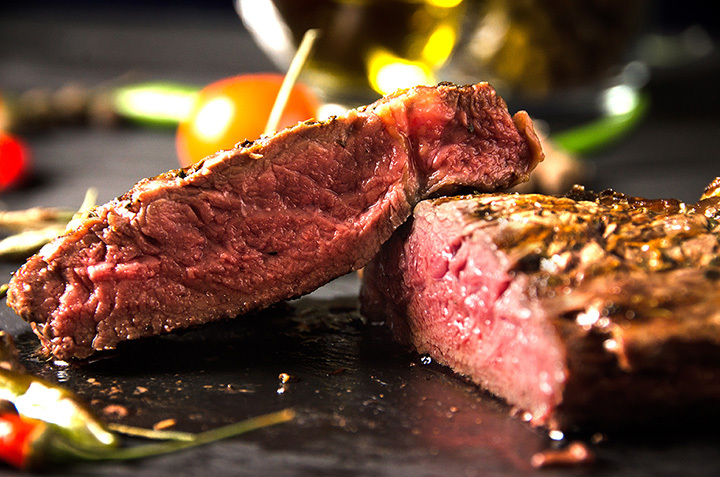 The secret the steaks at Casagranda’s Steakhouse is their specially-seasoned, hand-cut beef. They only use regionally-sourced, Rocky Mountain beef for their steaks and it certainly shows in the flavor and tenderness of the final product. Their setting in a historic, century-old building adds to the experience. Try the ribeye—they do it just right. For four decades, Jakes Bar & Grill has been serving up big beef in downtown Billings. A veritable institution, they source their steaks from local cattlemen and women and serve it up with a side of Montana hospitality. Jake’s Featured Ribeye, 16 ounces of campfire-charred beef, is enough to put a tear in a cowboy’s eye. To top it off !!! Steak in a castle? Of course! Especially if it’s the succulent steak at the Keep. While the outside may shout formal, the goal is a casual fine dining experience that’s punctuated with perfectly prepared beef. A deep wine list and spectacular mountain views just make the meal all that more memorable. If you’re looking for some of the best beef in Butte, don’t dodge the Derby Steakhouse. A local institution for nearly 30 years, the Derby serves strong drinks, thick Montana-style steaks, and does it all with stellar service. If you’re feeling lucky as well as hungry, there’s an attached casino. I rarely take pictures of food, but this may have been the best steak I've ever had. A classic western steakhouse, the Depot Restaurant was opened in 1974 and is still run by the same family. Hand-cut steaks and scratch-made accompaniments keep folks in Big Sky country coming back for more. If you’re feeling decadent, dive into the Depot Steak, a tenderloin topped with Alaskan king crab and béarnaise sauce. Just because I'm eating #keto doesn't mean I can't live a little. Had a lovely 15 oz. prime rib at Lydia's tonight. Good for the soul and no doubt I hit my protein macro. Although recently remodeled into a sleeker package, the Windmill is still the venerable supper club that Billings residents have relied upon for delicious steaks—not to mention their renowned prawns. Try the Applewood-bacon-smoked baseball sirloin. It’s a home run. Open Range us an upscale, New American steakhouse that stakes its menu on fresh, quality—and when possible, locally-sourced—ingredients. In addition to the regular menu steaks, they also offer a daily Butcher’s Cut that highlights available product and their kitchen creativity. Montana’s Rib & Chop House is a well-thought-of regional chain (locations in Montana and Wyoming)—and for good reason. From top-quality beef to stellar service (and crayons on the tables), the Rib and Chop Houses fire on all cylinders, making them a Montana favorite for flavorful beef.